The Kew Riverside Site is being redeveloped for housing and leisure facilities. 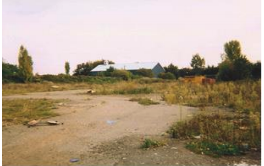 The site has been historically contaminated with waste materials from an adjacent domestic waste incinerator process. The identified contaminants include heavy metals, polycyclic aromatic hydrocarbons and other organic pollutants. The remediation strategy for the site was designed to address the identified source contamination with the intention of protecting both human health and groundwater receptors. The ex-situ remediation works involved the treatment of circa 6,500m³ of contaminated soils and associated groundwater in 5m³ batches utilising processing buckets (as the identified contaminated soils were clayey in nature). The processing buckets incorporate rotating blades at the bases facilitating a high degree of mixing. The treatment process involved mixing the contaminated materials with the designated E-Clay in slurry form and cementitious materials in dry form. The contaminated materials were mixed with the treatment materials to produce a homogeneous mass. Representative samples were taken throughout the treatment process – these samples were combined to produce composite samples for validation purposes. The works were conducted over a 9 week period under the auspices of Envirotreat’s Mobile Process Licence (MPL). Specialist technology, materials and supervision were supplied by Envirotreat. The main contractor (Jarvis Construction) supplied all the required plant and labour for the application of the Envirotreat Process. Validation of the treated material was carried out on 26 composite samples. These samples were leached and analysed at a UKAS accredited laboratory. The leachate results were compared to Dutch Intervention Values which were utilised for compliance purposes (i.e. site specific target levels [SSTL] as stipulated by the Environment Agency).